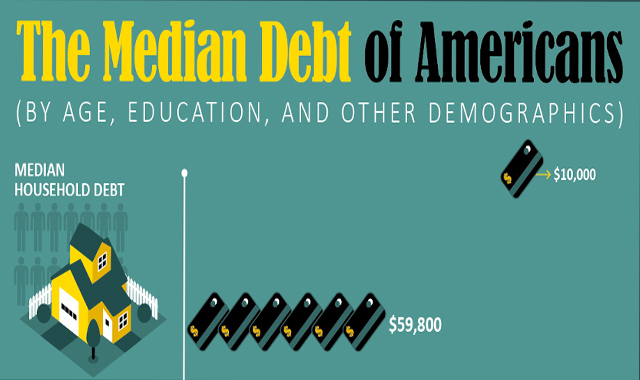 The Median Debt of Americans by Age, Education and Other Demographics #infographic ~ Visualistan '+g+"
Debt has become a huge financial burden to many Americans. Mortgages weigh us down the most followed by student loans, auto loans, and credit card debt. Every large purchase pushes us further into the red and it can be a lifelong battle to get out of it. Unfortunately these debts are a necessary way of life for many Americans that are trying to better themselves through education, need a vehicle to get to their job, and have to have a roof over their heads. But just how much debt are Americans really in? This infographic from TitleMax.com breaks down the median debt of Americans based on various demographics such as their age, education level, race/ethnicity, occupation, family structure, and even their debt by net worth. It’s interesting to see how debt differs between the millennial and baby boomer generations, or between couples with and without children. How does your own personal debt compare to that of someone in the same demographic as you?